SmartState analysis on hosts is processed by the Provider Operations role. It is enabled by default. For ESX or ESXi hypervisors, consider the following: ESX hosts utilize a service console for host management and can be accessed using SSH. ESXi hosts lack a service console and therefore SSH cannot be used to obtain information sets for patches, services, Linux packages, user groups, SSH Config, and FS Files. Before scaling down, evacuate or migrate any instances hosted on the node you are removing. For instructions on either procedure, see Section 13.20, “Migrating a Live Instance” or Section 13.21, “Evacuating an Instance”. Use the Resource Pools accordion to access the properties and objects associated with the resource pool. SmartState analysis on datastores is processed by the Provider Operations role. It is enabled by default. 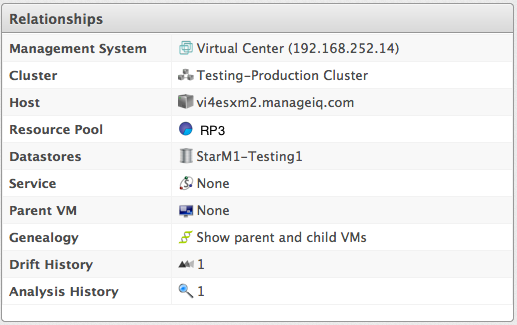 Use Show VM Types to include only managed/registered, managed/unregistered, or unmanaged virtual machines. Managed/Unregistered VM - A virtual machine or template that resides on a repository that is no longer connected to a management system or host, but exists in the VMDB. A virtual machine previously considered registered might become unregistered if the virtual machine is removed from management system inventory. Click (Configuration), and then (Remove Datastore from Inventory). Red Hat CloudForms optimization functions allow you to view utilization trends, and identify and project bottlenecks in your environment. In addition, you can predict where you have capacity for additional virtual machines, see Planning Where to Put a New Virtual Machine in the Deployment Planning Guide. For reporting of daily optimization data, incomplete days (days with less than 24 hourly data points from midnight to midnight) that are at the beginning or end of the requested interval are excluded. Days with less than 24 hourly data points would be inaccurate and including them would skew trend lines, therefore, the Optimize page requires at least two full days of daily data. All charted values are derived from trend calculations that requires at least two data points. Red Hat CloudForms allows you to view the resource utilization of your clusters, providers, and datastores. You can choose from summary, details, or report view. This procedure shows you how to view a utilization trend summary. Navigate to Optimize → Utilization. Click Summary if it is not already selected. Expand the tree on the left side, until you can see the desired providers, clusters, or datastores. Use the Options section in the Summary tab to change the characteristics of the data. Use Trends to select how far back you want to calculate the trend. Use Selected Day for the date you want to see percent utilization for in the chart on the Summary tab. Use Classification to only see trends for a specific applied tag. Use Time Profile to select an existing time profile. If the logged on user does not have any time profiles available, this option will not show. This procedure shows you how to view detail lines of a utilization trend. Click Details if it is not already selected. From the Options area, select how far back you want to view the trends for and any classifications you want to use. To find out more about resource utilization, view utilization trend reports. Click Report if it is not already selected. 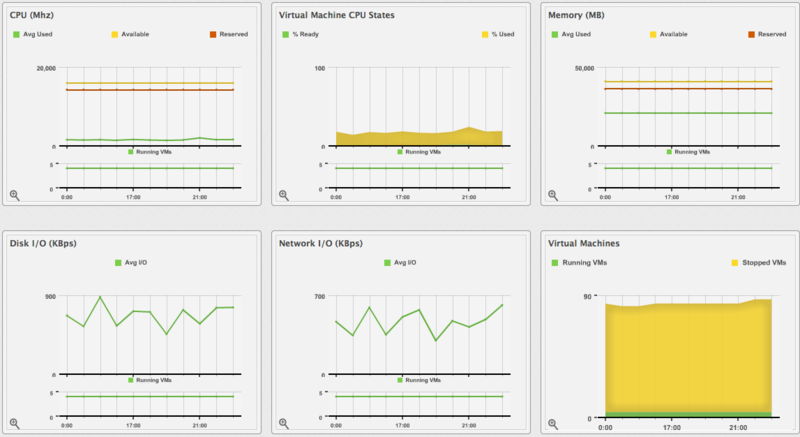 Red Hat CloudForms can show where bottlenecks occur in your virtual infrastructure. You can view them either on a timeline or as a report which can be downloaded for further analysis. Select Region from the Settings tab in the left pane of the appliance. In the right pane, under the C & U Collection tab, check the boxes for Collect for All Clusters under Clusters and Collect for All Datastores under Datastores, or check the boxes for the clusters/datastores you desire. Collect for All Clusters must be checked to be able to collect capacity and utilization data from cloud providers such as Red Hat OpenStack or Amazon EC2. For reporting of daily bottleneck data, incomplete days (days with less than 24 hourly data points from midnight to midnight) that are at the beginning or end of the requested interval are excluded. 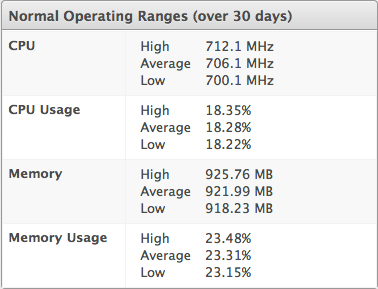 Days with less than 24 hourly data points would be inaccurate and including them would skew trend lines. 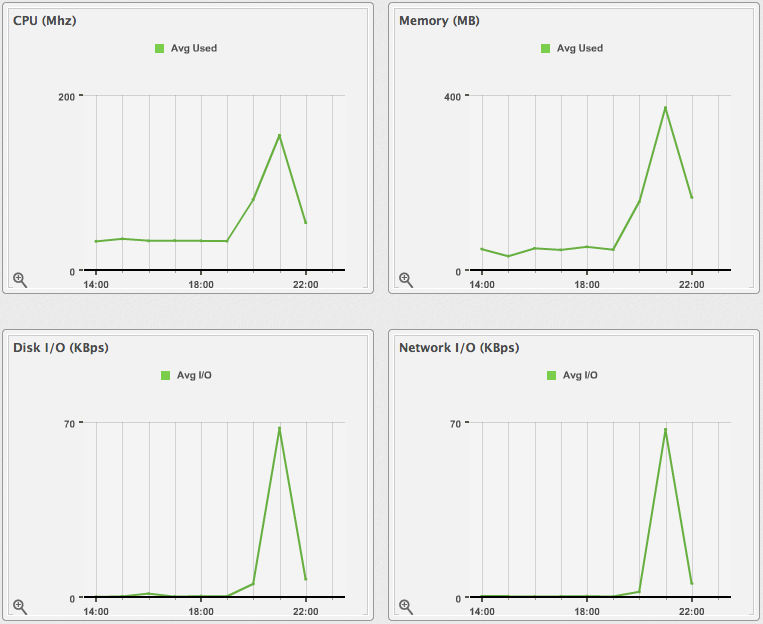 Therefore, at least one full day of hourly data from midnight to midnight is necessary for displaying the bottleneck charts under the Optimize tab. To find out more about bottleneck capacity or utilization, view a bottleneck summary. Navigate to Optimize → Bottlenecks. Use the Options section to change the characteristics of the data. Use Event Groups to select if you want to see bottlenecks based on capacity, utilization or both. Data is processed, and a timeline appears. Click on an icon in the timeline to see specific information on the bottleneck. Expand the tree on the left side, until you can see the enterprise, provider, or datastore that you want to see the trend for. A volume is a block storage device that you can attach to or detach from an instance to manage the storage available to that instance. Volumes are managed through storage managers, which are added automatically to Red Hat CloudForms when the corresponding provider is added. This section outlines the actions that you can perform on Amazon Elastic Block Store manager volumes. You can create and attach volumes to your storage manager. Navigate to Storage → Block Storage → Volumes. Select the Amazon Elastic Block Store manager from the Storage Manager list. Select an availability zone from the Availability Zone list. Select the type of the volume from the Cloud Volume Type list. See Amazon EBS Volume Types for more information on volume types. Enter the size of the volume in gigabytes (GB). Select whether the volume should be encrypted using the Encryption toggle. The volume appears in the list of volumes after it has been provisioned. You can create a snapshot of a volume to preserve the state of the volume at a specific point in time. The snapshot can be used to create a duplicate of the volume. Click the volume to snapshot to open the volume’s summary page. 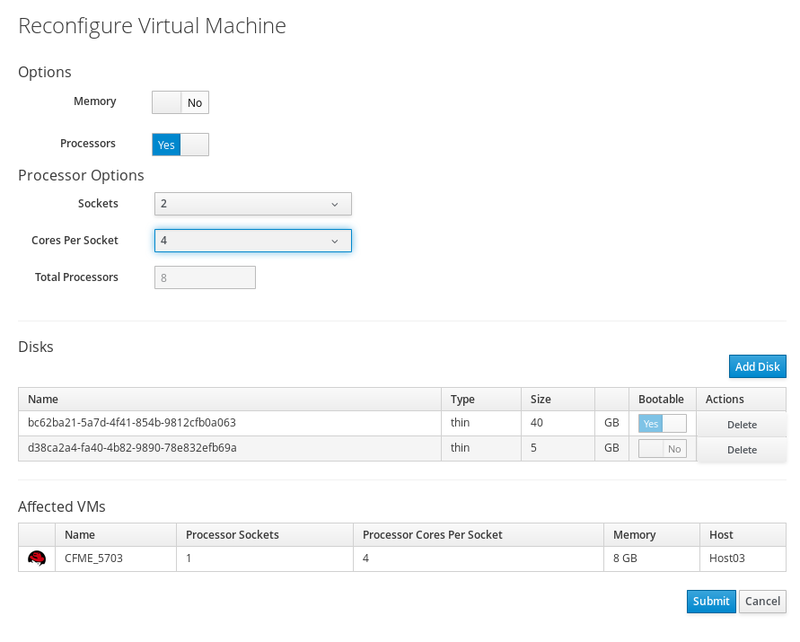 Click (Configuration), then click (Create a Snapshot of this Cloud Volume). Enter a name for the snapshot in Snapshot Name. Click Cloud Volume Snapshots on the summary page of a volume to view the snapshots for that volume. Select the volume to attach. Click (Configuration), then click (Attach selected Cloud Volume to an Instance) to open the Attach Cloud Volume screen. Select an instance from the list. Optionally, enter a Device Mountpoint. Click (Configuration), then click (Detach selected Cloud Volume from an Instance) to open the Detach Cloud Volume screen. You can edit several properties of existing volumes. Select the volume to edit to open its summary page. Click (Configuration), then click (Edit this Cloud Volume). Enter a new Volume Name. Select a new volume type from the Cloud Volume Type list. See Amazon EBS Volume Types for more information on each of the volume types. Enter a new size in gigabytes. Select the volume to delete. Click (Configuration), then click (Delete selected Cloud Volumes). This section outlines the actions that you can perform on OpenStack Block Storage manager volumes. After creating a volume, only the volume name can be edited. Select the OpenStack Block Storage manager from the Storage Manager list. Under Placement, select the cloud tenant to attach it to. You can create a backup of a volume to protect against data loss, and restore it in the future. For OpenStack Block Storage managers, the openstack-cinder-backup service must be enabled on the OpenStack Block Storage manager to create a volume backup. Click the volume you want to back up to open the volume’s summary page. Click (Configuration), then click (Create a Backup of this Cloud Volume). Enter a name for the backup in Backup Name. (Optional) Select Incremental? to take an incremental backup of the volume instead of a full backup. You can take an incremental backup of a volume if you have at least one existing full backup of the volume. An incremental volume saves resources by capturing only changes made to the volume since its last backup. See Create an Incremental Volume Backup in the Storage Guide for more information. (Optional) Select Force? to allow backup of a volume attached to an instance. Selecting the Force option will back up the volume whether its status is available or in-use. Backing up an in-use volume ensures data is crash-consistent. View a volume’s backups by clicking Cloud Volume Backups on the volume’s summary page. See Back Up and Restore a Volume in the Storage Guide for more information about backups. Click the volume whose backup you want to restore. This will open the volume’s summary page. Click (Configuration), then click (Restore from a Backup of this Cloud Volume). Select the volume to restore from in the Cloud Volume Backup list. Navigate to Storage → Block Storage → Volume Backups. Select a Cloud Volume Backup to restore. Click (Configuration), then click (Restore backup to Cloud Volume). Select the Volume to restore from the backup. Select the Cloud Volume Backups to delete. Click (Configuration), then click (Delete selected Backups). See Create, Use, or Delete Volume Snapshots in the Storage Guide for more information about snapshots. Only the volume name can be edited on an existing volume. Enter the new Volume Name. 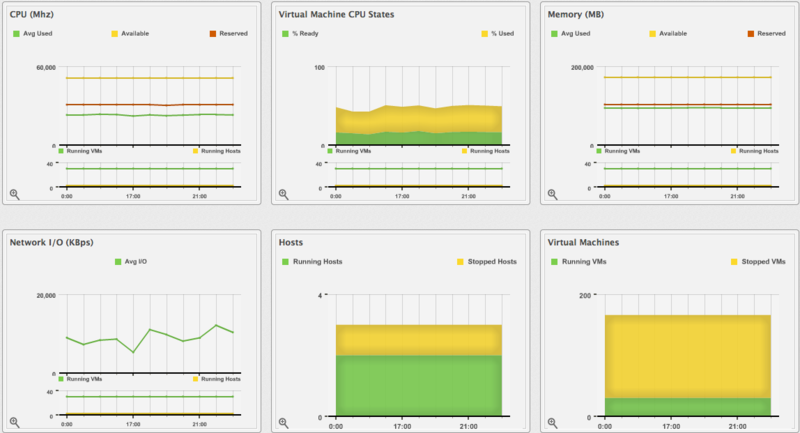 Flavors indicate the resource profiles available for instances. Each flavor contains a value set for CPUs, CPU cores and memory. Flavors allow you to pre-configure resource settings, which you can then apply during instance provisioning. You can also change the flavor of a provisioned instance; see Section 13.19, “Resizing an Instance” for instructions. Use the Relationship section in the flavor accordion to see items related to the flavor. Red Hat CloudForms enables configuration and administration for the software-defined networking component of Red Hat OpenStack Platform. The virtual network infrastructure enables connectivity between instances and the physical external network. This section describes common cloud network administration tasks, such as adding and removing subnets and routers to suit your Red Hat OpenStack Platform providers. Create a network to provide instances a place to communicate internally and receive IP addresses using Dynamic Host Configuration Protocol (DHCP). A network can also be integrated with external networks in your Red Hat OpenStack Platform deployment or elsewhere, such as the physical network. Keystone API v3 is required to create cloud tenants on Red Hat OpenStack Platform cloud providers. For more information, see OpenStack Identity (keystone) in the Red Hat OpenStack Platform Architecture Guide. For further details on cloud network objects and administration, see the Networking Guide in the Red Hat OpenStack Platform documentation..
Navigate to Networks → Networks. Click (Configuration) and click Add a new Cloud Network. In the Network Providers area, select a Network Manager from the drop-down menu. Under Placement, select a Cloud Tenant. In the Network Provider Information section, choose a Provider Network Type. If Local is selected, provide a Physical Network name. If GRE is selected, provide a Physical Network name and Segmentation ID. Provide a descriptive Network Name based on the role the network will perform. Set the Administrative State to control whether the network is immediately available. Establish Shared status of the network. Select a network from the list view. Click (Configuration), then (Edit selected Cloud Network). Select a cloud network from the list view. Click (Configuration), then click Delete selected Cloud Networks. Red Hat CloudForms enables creation and administration of subnets for your cloud networks. Create subnets in pre-existing networks as means to grant network connectivity to instances. Subnets are the means by which instances are granted network connectivity. Each instance is assigned to a subnet as part of the instance creation process. Tenant networks in OpenStack Networking can host multiple subnets. Subnets are isolated from one another. Host distinctly different systems on different subnets within the same network. Instances on one subnet that wish to communicate with another subnet must have traffic directed by a router. Place systems requiring a high volume of traffic amongst themselves in the same subnet, avoiding routing and subsequent latency and load issues. Add a subnet to an existing cloud network following the procedure below. Navigate to Networks → Subnets. Click (Configuration), then click Add a new Cloud Subnet. The Gateway IP address of the router interface for the default gateway. Enable DHCP services for the subnet. DHCP allows automated distribution of IP settings to instances. Select the IP Version. The IP address range in the Network Address field must match whichever version you select. Input the Subnet CIDR address in CIDR format, which contains the IP address range and subnet mask in one value. Determine the address by calculating the number of bits masked in the subnet mask and append that value to the IP address range. For example, the subnet mask 255.255.255.0 has 24 masked bits. To use this mask with the IPv4 address range 192.168.122.0, specify the address 192.168.122.0/24. Click on a subnet from the list view. Click (Configuration), then (Edit this Cloud Subnet). Edit Cloud Subnet details fields. Red Hat CloudForms enables configuration for Red Hat OpenStack Platform provider cloud network routing services using an SDN-based virtual router. Routers are a requirement for your instances to communicate with external subnets, including those out in the physical network. Routers and subnets connect using interfaces, with each subnet requiring its own interface to the router. A router’s default gateway defines the next hop for any traffic received by the router. A router’s network is typically configured to route traffic to the external physical network using a virtual bridge. Add a network router to an existing cloud network by following the procedure below. Navigate to Networks → Network Routers. Click (Configuration) and click Add a new Router. In the Network Provider area, select a Network Manager. Choose to Enable Source NAT. In Source Network Address Translation (SNAT), he NAT router modifies the IP address of the sender in IP packets. SNAT is commonly used to enable hosts with private addresses to communicate with servers on the public Internet. Select a network router from the list view. Click (Configuration), then (Edit selected Router). Interfaces allow you to interconnect routers with subnets. As a result, the router can direct any traffic that instances send to destinations outside of their intermediate subnet. Click (Configuration), then (Add Interface to this Router). Select a Subnet from the list. You can remove an interface to a subnet if you no longer require the router to direct its traffic. Select a network router in the list view. Click (Configuration), then (Remove Interface from this Router). Click (Configuration), then click Delete selected Routers. Floating IP addresses allow you to direct ingress network traffic to your cloud network instances. Define a pool of validly routable external IP addresses, which can then be dynamically assigned to an instance. All incoming traffic destined for that floating IP is routed to the instance to which it has been assigned. Red Hat OpenStack Networking allocates floating IP addresses to all projects (tenants) from the same IP ranges/CIDRs. As a result, every subnet of floating IPs is consumable by any and all projects. Manage this behavior using quotas for specific projects. Floating IP addresses allow you to direct ingress network traffic to your instances. Add floating IP addresses to an existing cloud network by following the procedure below. Navigate to Networks → Floating IPs. Click (Configuration) and click Add a new Floating IP. (Optional) An Associated Port for the floating IP. (Optional) The Floating IP Address. Click on a floating IP from the list view. Click (Configuration), then (Manage the port association of this Floating IP). 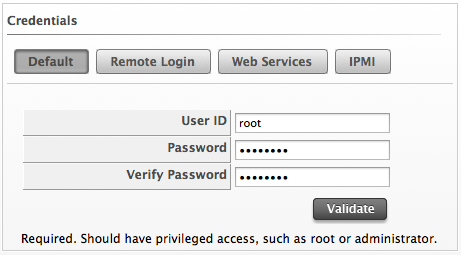 To disassociate a port, delete the Port id field information. SClick on a floating IP from the list view to view its summary page. Click (Configuration), then click Delete this Floating IP. You can group instances using security groups to restrict port or IP address accessibility. Security groups can be created and assigned to instances using Red Hat CloudForms instance provisioning. Editing security group information allows users to make changes to existing security group details and firewall rules, in additional to adding new firewall rules. Click on a security group to view the summary page. Click (Configuration), then (Edit this Security Group). Under Security Group Information, edit the Security Group Name and the Security Group Description. Edit existing Firewall Rules or add new firewall rules by clicking Add a Firewall Rule. Click on a security group in the list view to view its summary page. Click on (Configuration), then click Delete this Security Group. Images are the static templates containing the software configuration from which you provision a running Instance - a virtual machine, with which you can interact - on your cloud provider. The Instance and Images containers, combined with the ability to analyze information inside each instance or image, provides in-depth information across the cloud environment. This rich set of information enables Red Hat CloudForms users to improve problem resolution times and effectively manage instances and images in their cloud environment. The Instances and Images pages display all instances and images the server discovered from your cloud providers. The taskbar on each page is a menu driven set of buttons that provide access to functions related to instances and images. Console uses Virtual Thumbnails to describe instances and images. Each thumbnail contains four quadrants by default. This allows you to glance at an instance or image for a quick view of its contents. While you can set the default view for different pages from the settings menu, then Configuration → My Settings → Default Views, the current view can also be controlled from the Instances pages. Use * at the beginning of a term to search for names that end with specific characters. For example, type *\sp2 to find all instances whose names end with sp2. Manage security groups associated with cloud provider instances using Red Hat CloudForms. 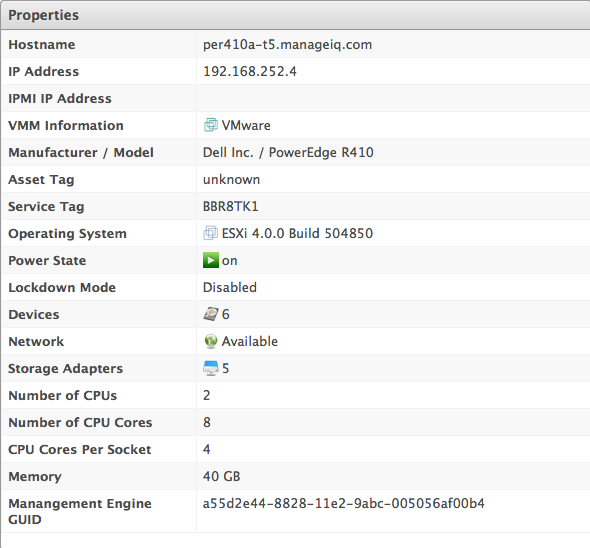 Click on Instances by Provider, and select an instance. Click (Configuration), then click (Add a Security Group). Select a Security Group from the drop-down menu to add to the instance. Click (Configuration), then click (Remove a Security Group). Select a Security Group from the drop-down menu to remove from the instance. For more information about the requirements and underlying OpenStack process involved, see Resize an Instance in the Red Hat OpenStack Platform Instances and Images Guide. See Chapter 11, Flavors and Manage Flavors in the Red Hat OpenStack Platform Instances and Images Guide for more information. Live migration involves moving a live instance between Compute nodes. Live migration is useful for avoiding instance downtime during cloud maintenance or load management. See How to Migrate a Live Instance in the Red Hat OpenStack Platform Migrating Instances guide for details on the underlying OpenStack process. Block Migration: check this option to perform a block-based migration. With this migration, the entire virtual machine image is moved from the source node to the destination node. If your OpenStack provider uses shared storage, leave this option unchecked. See Prerequisites in the Red Hat OpenStack Platform Migrating Instances guide for related information. If a Compute node is shut down, you can evacuate instances hosted on it. 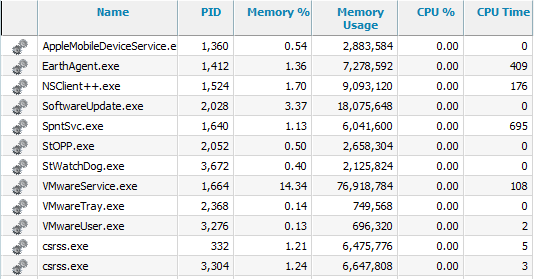 This is only useful if the instances use shared storage or block storage volumes. See Evacuate Instances in the Red Hat OpenStack Platform Instances and Images Guide for details on the underlying OpenStack process. Click on the instance or image to open its summary page. From the Security section of the summary page, click Users. Using an Analysis Profile, collect event log information from your instances. See the Setting a Default Analysis Profile section in the CloudForms General Configuration guide. Click (Lifecycle), and then (Retire selected Orchestration Stacks). A pop-up window appears to confirm the action. Click (Configuration), then click (Remove selected Key Pairs from Inventory). A warning appears to confirm the action. Navigate to Storage → Object Stores to see a list of all cloud object stores along with information including Key, Size (bytes), Object Count, Cloud Tenant, and Cloud Provider. Click on an object store to see its properties and relationships with the cloud provider, tenant, and object store on the summary page. Navigate to Storage → Object Stores. After adding a VMware provider, Red Hat CloudForms automatically discovers all vSphere distributed switches (vDS) on that provider and collects the information in the Red Hat CloudForms inventory. Navigate to Compute → Infrastructure → Networking to see a list of all VMware switches, along with information including Name, Ports, and UUID. 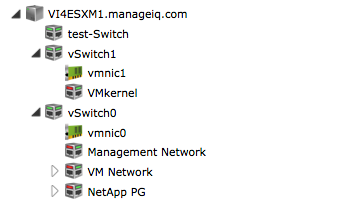 Switches and port groups are listed by provider, then cluster on the sidebar. 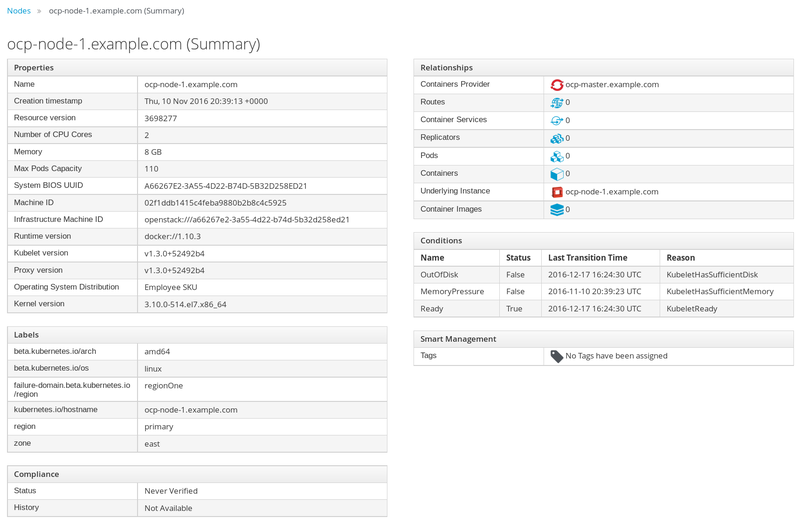 Click on a switch to view its summary page, which displays relationships with hosts, and any tags. Use tags to categorize vSphere distributed switches. Navigate to Compute → Infrastructure → Networking. Select the switches to tag. Select more tags or click Save to apply the tags. This chapter provides information on managing resources on your containers providers. The containers overview page shows information on all containers providers and entities known to CloudForms. The Overview page provides links to other summary pages which contain further information on the containers providers and entities. The Overview page also provides metrics for Aggregated Node Utilization, Network Utilization Trend, New Image Usage Trend, Node Utilization, and Pod Creation and Deletion Trends. To reliably associate pods and images, CloudForms requires information from the docker-pullable field, added in OpenShift 3.3.1.2. This can affect the results of the Chargeback by Image report for older OpenShift providers, and potentially cause image inspection (done as part of Smart State Analysis) to fail due to associating a container to the wrong image. Consequently, CloudForms may not report accurate information about pods and images in OpenShift providers before version 3.3.1.2. Container entity (object) summaries are found at Compute → Containers → Entity, where you can view information about container entities and their components. The status of the provider and its components. The relationships between different entities of the containers provider. These relationships are summarized in the Relationships box on the right-hand side of the summary page. The number of entities on a node. A node’s capacity and utilization. The version of the underlying operating system and software. To view the timeline of events for a node from a container nodes summary page, click (Monitoring), and then (Timelines). The relationships of the container to a related node, pod, or image. The node the container runs on. Properties of the container image, such as name, tag, etc. The containers currently using the images. The image registry the image is from. Which images are from the registry. The number of images that come from that registry. Which containers use images from that registry. The host and port of the registry. The containers that are part of the pod. The services that reference the pod. The node the pod runs on. If the pod controlled by a replicator. The IP address of the pod. The number of requested pods. The number of current pods. The labels and selector for the replicator. The pods that the container service provide traffic to. The port configurations for the container service. The labels and selector for the container service. The pods the volume is connected to. The volume’s iSCSI target details (if applicable). The build configuration the container build is based on. Which build instances have been created. Which phase in the build process the instance has completed. Which pod a build instance reside in. The project the template is associated with. The objects the template contains. The parameters that can be used with the template’s objects. The Topology widget is an interactive topology graph, showing the status and relationships between the different entities of the containers providers and projects to which Red Hat CloudForms has access. 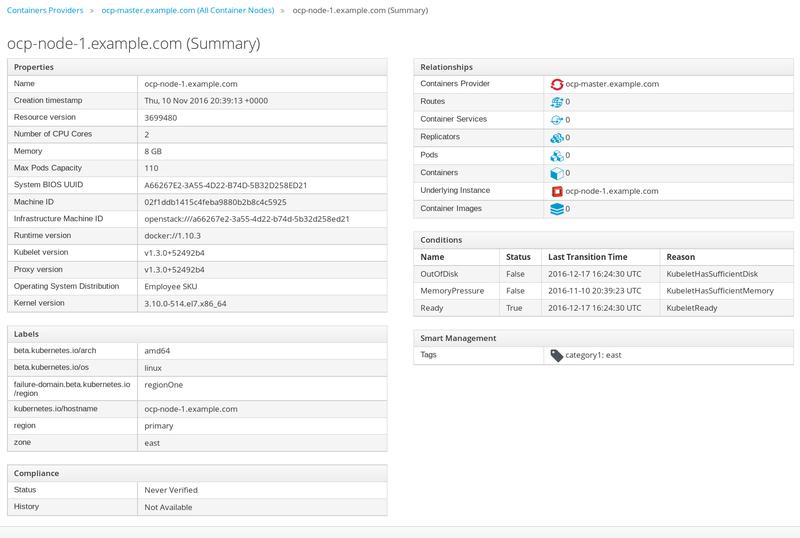 On the provider summary page, click Topology in the Overview box on the right side of the page. The project topology page displays the project as the center node, surrounded by its related entities. Navigate to Compute → Containers → Projects. On the project summary page, click (Topology View) on the top right side of the page. Navigate to the settings menu, then My Settings, and click on the Visual tab. Select the number of container items from the drop-down under Topology Default Items in View. To monitor the status of container image SmartState Analysis tasks, navigate to the settings menu, then Tasks. The status of each task is displayed including time started, time ended, what part of the task is currently running, and any errors encountered. 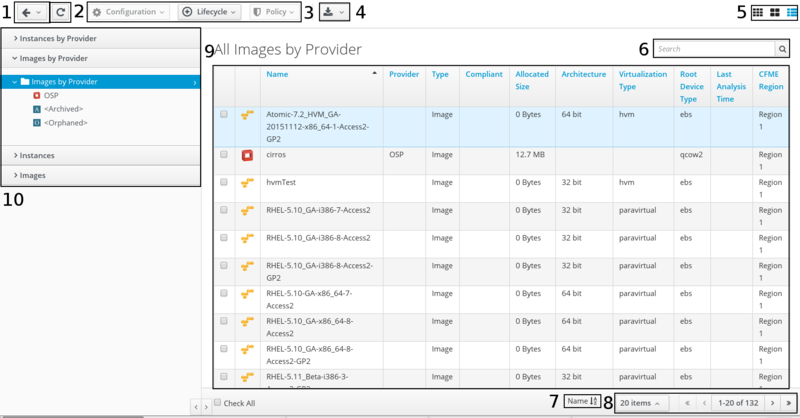 See Scanning Container Images in CloudForms with OpenSCAP for details on scanning container images using OpenSCAP policies. Container object labels in OpenShift can be used to automatically create tags and tag categories in Red Hat CloudForms. This is done by mapping Red Hat CloudForms tags to existing OpenShift or Kubernetes labels. 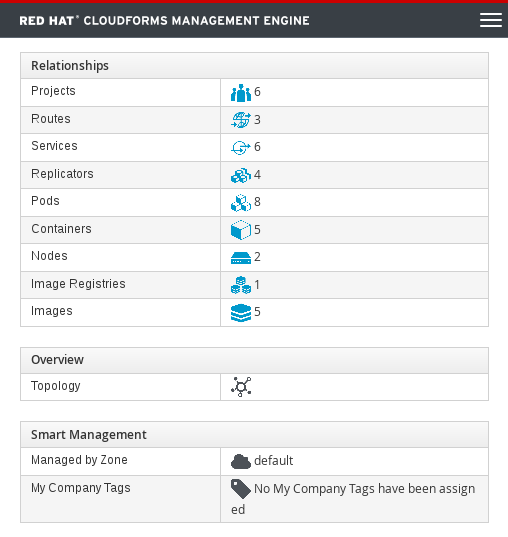 Tags automatically created from OpenShift labels are completely managed by the Red Hat CloudForms system and cannot be manually assigned or unassigned. Deleting a mapping rule from Red Hat CloudForms immediately deletes the resulting tags. You can view a container entity’s OpenShift labels on the entity’s details page under Labels. The following example shows how to configure tagging for a node, but the same steps can be used for mapping labels to tags on other container entities. Note the key of the OpenShift label you want to map to a Red Hat CloudForms tag. OpenShift labels consist of two parts: a key and a value. Navigate to Compute → Containers → Nodes. Select a node to open its summary page. 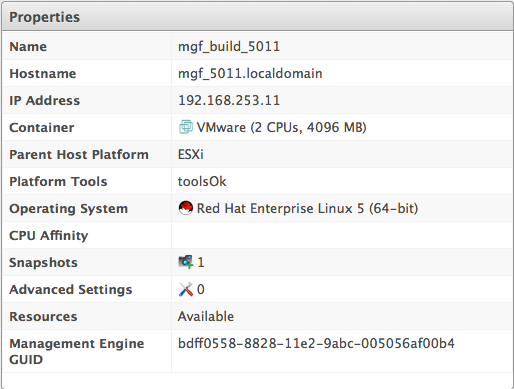 Under Labels, note the label(s) to map to Red Hat CloudForms tag(s). Any OpenShift labels will list the key in the left column of the Labels table, and the value in the right column of the Labels table. To create an OpenShift label, see Developer CLI Operations in the OpenShift Container Platform CLI Reference guide. A new label added in OpenShift will only show up in Red Hat CloudForms after the next OpenShift provider refresh. Navigate to Configuration and select the region. Click the Map Tags tab. Click Add to create a new mapping rule. Select a container entity to tag from the Entity list, or select <All> to tag all entities. Specify the key from the OpenShift label you noted earlier in the Label field. Specify a Red Hat CloudForms tag category in Category to map the label to. If the tag category does not exist yet in Red Hat CloudForms, it will be created automatically. Click Add. The mapping will show in the table on the Map Tags tab. Select the provider to refresh. Click (Configuration), and then (Refresh Items and Relationships). 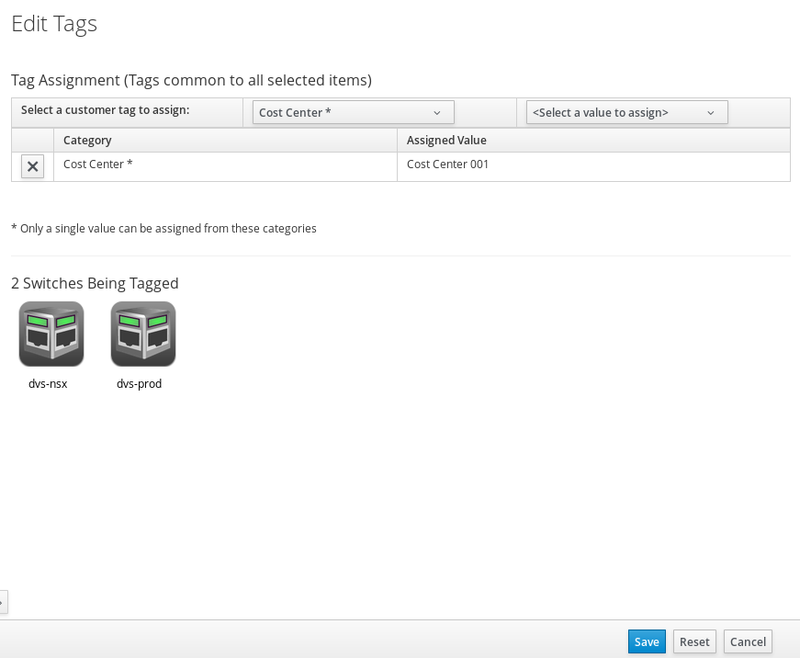 The label will display on the entity’s summary page under Smart Management under Company Tags as <Category> : <value>. Any container entity with the OpenShift zone label will be tagged automatically as category1 in Red Hat CloudForms. If the value for zone is south, for example, the entity will be tagged as category1 : south. You can use these tags to create reports. See Monitoring, Alerts, and Reporting for details on creating reports.